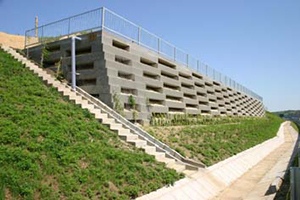 In the civil engineering practice it is a regular task to design and construct gravity retaining walls and steep slopes. The required stability is normally ensured by gravity- or angular retaining walls, pile walls or gabion elements. Using reinforced soil structures retaining walls can be built with much better financial conditions, resulting in considerable savings. Gradex Ltd. has designed and constructed reinforced soil retaining walls in Hungary since 1996 and has the highest number of references. 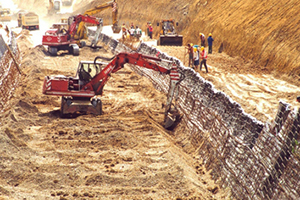 Construction of soil retaining walls reinforced with geosynthetic materials is simple, does not required special technology, can be very well mechanised and, due to this, the construction time is much shorter than that of other structures. The appearance of retaining walls can be numerous. Their faces are normally sodded but can also be covered by small or large building blocks, and provided irrigation on the steep surface can be solved, retaining walls may be surfaced with specially chosen vegetation. To date Gradex Ltd has built 15000 m2 sodded reinforced retaining wall in Hungary. The largest of them is located in the cuts of the Slovenian Railway where mosaic clay soil is supported by these retaining walls for a length of approx. 2.5 km. We also constructed retaining walls to repair slope slips which continued in a less steep slope, all this while the road was trafficked. We furthermore constructed an 8 m high reinforced soil retaining wall at Biatorbágy that supports a main road with truck traffic along the Hegyeshalom railway line. 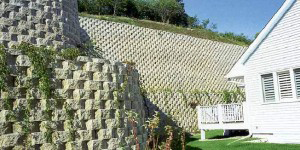 In the Szentendre Skanzen we built reinforced soil retaining walls with gabion appearance. Our plans include the construction of concrete walls with small building block facing creating a friendly environment. We planned to install to several locations retaining walls with vegetation and irrigation which also meet the requirements of a human friendly environment. These solutions are ideal for shopping centres, industrial parks and residential areas.